Cut the al fresco Spinach and Feta Sausages on the bias 1/4" thick. Cook the fettuccine according to package directions. Drain and reserve 1/4 cup of pasta water. Keep warm. Coat a large skillet with cooking spray and heat over high heat. Add the olive oil & sauté the garlic and onion for 2 minutes. Add the sliced sausage pieces and sauté for 3-4 minutes. 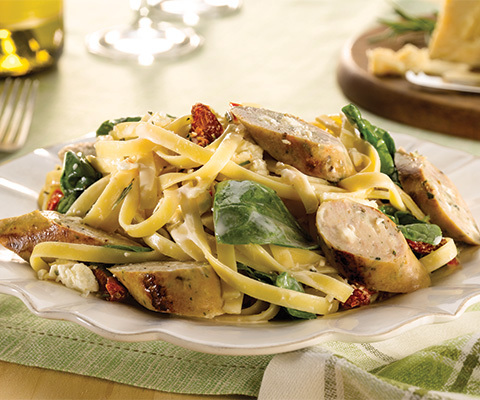 Fold in the fettuccine, rosemary, sun-dried tomatoes and cheeses. Add the Light Creamy Alfredo Pasta Sauce and reserved pasta water. Simmer over medium heat for 8-10 minutes or until well-heated. Toss in the baby spinach at the end, and stir until all the ingredients are incorporated together (about 1 minute). Remove from heat and serve immediately.